Physician, anthropologist, travel writer, novelist, politician, Paolo Mantegazza (1831-1910) was probably the most eclectic figure in late-nineteenth century Italian culture. A prolific writer, Mantegazza can be seen as a forerunner of what has come to be known as cultural studies on account of his interdisciplinary approach, his passionate blend of scientific and literary elements in his writings, and his ability to transcend the boundaries between 'high' and 'low' culture. Though extremely popular during his lifetime both in Italy and abroad, Mantegazza's works have not been made available in a significant English language compilation. This volume is a representative overview of Mantegazza's key works, many of them translated into English for the first time. In addition to the unabridged Physiology of Love (1873), a veritable best-seller at the time of its initial publication, this compilation features selections from Mantegazza's writings on medicine, his travelogues, his epistolary novel One Day in Madeira (1868), and his treatise on materialistic aesthetics. 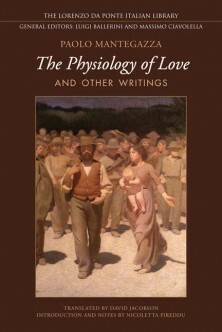 Replete with an extensive and informative introduction by the editor, The Physiology of Love and Other Writings also excerpts Mantegazza's works of science fiction, memoir, and social and cultural criticism. As an anthology of the works of Paolo Mantegazza, a writer of diverse topical orientations, this volume is also an account of the circulation of ideas and cross-fertilization of disciplines that defined a crucial period of Italian and European cultural life.